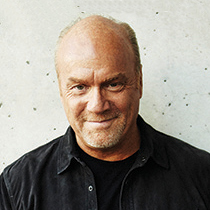 Greg Laurie shares a poignant email exchange between him and his son. I have spent a lot of time poring over photos of my late son, Christopher. I have also searched emails that I'd sent and received from him over the last few months. I came across a really sweet one he'd sent me about a month before he left us unexpectedly for heaven. As you know, he was on staff at the church and was designing amazing pieces for our Harvest Crusades events and for the church. Christopher oversaw a group of very talented designers, and together they were doing amazing work. You are doing the Lord’s work now, so the devil attacks in strange ways. You are doing cutting-edge graphics that are helping to get the gospel out around the world. You are involved in a home Bible study that is touching your friends and family. You are realizing your God-given potential. And you know what? Better things are coming! God has blessed you and the enemy will simply attack. Keep doing what you are doing. That’s what I always have done. When attack comes, I “batten down the hatches” and go at it even harder, ’cause I know the enemy’s objective is to distract and discourage me. When Nehemiah was building the walls of Jerusalem, he came under criticism and attack for it. So you know what he did? He just kept building that wall. That’s what we need to do too. Mom and I love you very much, and we are proud of you and Brittany. P.S. We like Stella quite a bit too! The LORD protects me from danger—so why should I tremble? When evil people come to destroy me, when my enemies and foes attack me, they will stumble and fall. Though a mighty army surrounds me, my heart will know no fear. Even if they attack me, I remain confident. The one thing I ask of the LORD—the thing I seek most—is to live in the house of the LORD all the days of my life, delighting in the Lord’s perfections and meditating in his Temple. Then I will hold my head high, above my enemies who surround me. At his Tabernacle I will offer sacrifices with shouts of joy, singing and praising the LORD with music. Listen to my pleading, O LORD. Be merciful and answer me! Thank you so much for the loving encouragement. I am so thankful for what the Lord has done in my life the last couple years. I want what He wants for me. I have been blessed with the most wealth I ever wanted: loving parents and a brother who serve the Lord and desire Him first, a beautiful wife who knows Jesus, a beautiful daughter with another on the way. I am truly rich and no man can take those things from me. I love you and mom so very much. Please be safe in your travels, talk to you soon. I choke up when I read those words. He really understood what true wealth was. No, because for Christopher, the best has come. For he is now in God’s presence and as the apostle Paul said, “It is far better” than anything on earth (Philippians 1:23). It is very hard for us, but when we remember where he is, we rejoice. And we know that better days are coming for us all. Not just on this earth, but in heaven.